Gen-la Kelsang Jampa is the Deputy Spiritual Director of the New Kadampa Tradition – International Kadampa Buddhist Union (NKT-IKBU) and Resident Teacher of Kadampa Meditation Center Texas in Dallas. 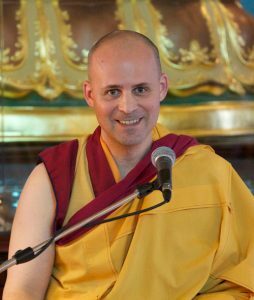 He is an American Buddhist monk dedicated to helping people solve their daily problems by developing the capacity of their mind through the practice of meditation and modern Buddhism. Gen-la Kelsang Jampa is the Deputy Spiritual Director of NKT-IKBU and the Resident Teacher at KMC Texas. He has studied under Venerable Geshe Kelsang Gyatso Rinpoche and taught internationally for many years and is greatly admired for his warm personality and clear, inspiring teachings. Buddhism has a timeless and universal relevance, and can be practiced by anyone in any culture, regardless of race, gender, or age. For more information on meditation, see The New Meditation Handbook. There are many different virtuous objects of meditation, but the most meaningful the objects of the twenty-one meditations, from meditation on relying upon a Spiritual Guide to meditation on emptiness, the ultimate nature of phenomena.